What kind of Outdoor Patio Fire Pit will work for you. Many different styles are available, some will be portable and others will be more like a stove in the kitchen. 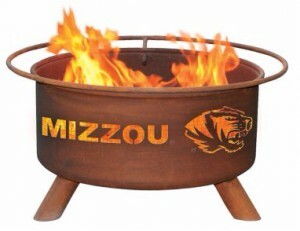 The smaller fire pits will be portable so that you can move them and even take them to a tailgate party. You can use a fire pit to heat, cook or just make a mood for your outdoor area. Now lets look at the different types of fire pits and see what will work best for your outdoor space. Permanent fire pits are made of stone or brick. You lay a foundation and they cannot be moved. They can be a focal area of your outdoor space just like a fireplace inside your home. Permanent fire pits can be fueled by Propane or LP gas. The initial cost is very high and it will require a larger space than the other examples. Stone fire pits can be made in almost any style. This is paver stones in a circle or square pattern with a grate on top. Just choose your space and design your pit. These can be made as a standalone and cannot be moved without rebuilding in another location. There are some kits available for stone pits. Cost is still high for this type of pit. If looking for a fire pit for a small area the Chimenea type will work for you. The vertical design will take up less of a footprint than the other types of fire pits and give you the same results. Look at the Oakland living Elite Chimenea for a smaller pit for small concrete patios. Cost is lower, fire pit can be moved without a lot of trouble. You cannot use this type of fire pit on a wooden or composite deck without some kind of barrier. See some of my examples of chimeneas here. Smaller portable fire pits can be placed in the inside of a ring of stones and you can have both a permanent and portable fire pit. Metal fire pits are the most portable and after a little cleaning you can use them at your favorite tailgate party. 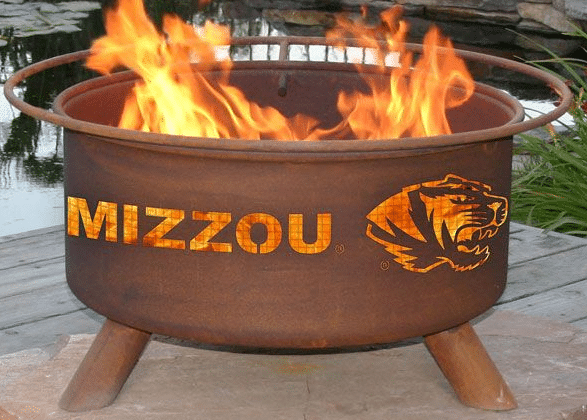 Click here for more information on Collegiate Fire Pits. This is one of the cheapest kinds of fire pits and is the most portable. Just need to make sure it is cool enough to handle. Use on wooden or composite decks will result in damage to the surface, look at some of my solutions below. 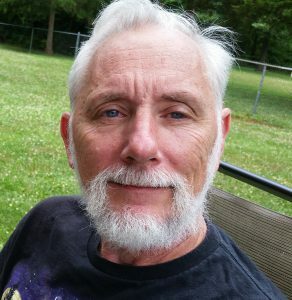 See some of my examples here. Propane powered fire pits come in many styles. Matching your sitting furniture with the fire pit for a great design for your outdoor space will be the envy of your friends at your outdoor parties. Most will take a standard 20 pound propane tank and will burn without any tending or ash cleanup after the fire. Cost is high, you can use on any surface, will not damage wood or composite decking materials. See some of my examples here. Fire pits can also be part of a chat set where you can get chairs and a fire pit table combination. 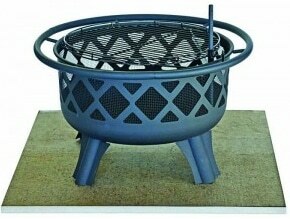 This type of fire pit has a flat top to cover the pit to give you a coffee table when the pit is not needed. These will come in wood burning and propane types. See some of my examples here. One of my favorite things to do is to set the portable metal fire pit in the driveway on Halloween. It gives heat to a cool night and the neighbors all gather to one location for handing out candy. The fire pit brings out people that you don't normally see every day. Fire pits can be used at any time you can be outside. In the evening during the summer we have a hot dog roast around our fire pit with all of the kids in the neighborhood. This brings them together to tell stories of their summer days. Going to your favorite Collegiate game? Having friends over to have that cookout while you watch the game? Get your favorite team on your fire pit and enjoy. When looking at Fire Pits for your outdoor space do not forget the accessories that go with it. If you have a smaller pit a cover will make it last a few more seasons that if it is not protected from the weather. Other items of interest are deck mats, log racks, or log movers. These items are made to make your outdoor space more enjoyable. Enjoy your outdoor fire pit, Smores and hot dogs. Any questions or comments please use the form below and I will answer. Several things will have to be considered where to use your fire pit. Wood burning pits should never be used on a wooden or composite deck without some kind of protection for your surface from the heat. Two of my solutions are available if you want to have a burn pit on one of these surfaces. 1. A Deck Protect system will give you a heat shield against the heat protecting your surface. See my article on this system here. You will have to think ahead and have the protection down before you start your burn pit. 2. Most Propane fire pits will not have to have any protection to keep from damaging a wooden or composite surface. The small burn pit is on the top and does not produce the downward heat that a wood burner does. This is the option that I would use if it was me. See some of my gas fire pits here. For any social event in your back yard or tailgating, an outdoor patio fire pit can be the center of your activities. I use mine almost year round.in the Midwest. In the summer we do hot dogs, marshmallows or Smore's. This will never go out of style even if you just have adults at your event. Having a style of fire pit that fits how and where you will use it is what you will have to determine, as the styles are endless. I have a few options on my website at this link here. Thanks for reading my article, if you got some benefit from this information please pass on to your friends on your social networks. 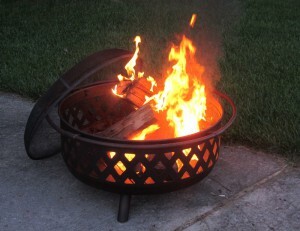 If you have a fire pit that you use and like, send me an email with some pictures and I will add it to my site. Any questions or comments use the forms below and I will get back to you. Very useful information on the fire pit. I love the Halloween idea. 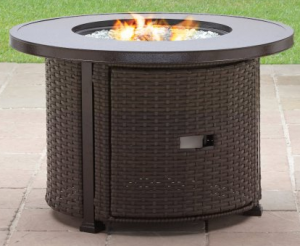 We’ve got a fire pit like the one in the picture but never used it in that way. I also take mine camping and use it. I don’t like the idea of a campfire in some locations. They have so many uses if you think about it.